Location Map for 73P fragments B and C (click to enlarge). The orientation is as seen to the north-east from Adelaide at around midnight. Similar views will be seen elswhere in the Southern hemisphere at equivalent local times (For a more general spotters map see here). Ignore the magnitudes, 73P-C is around mag 7.2-7.0, and B is around 7.5 at the moment. The circle is the field of view of 10x50 binoculars. 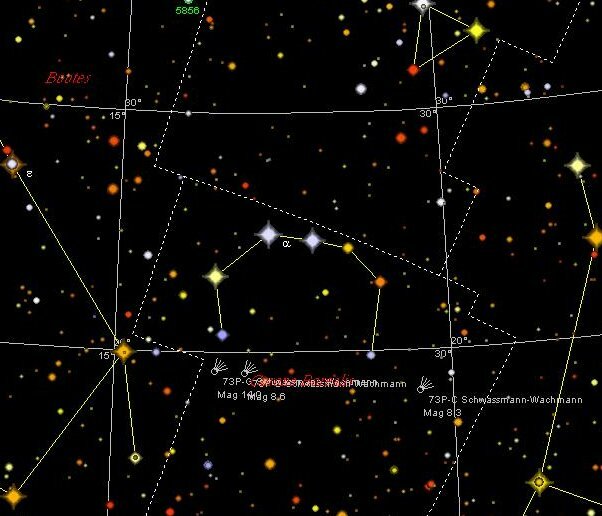 Fragment B is close to a bright star in the square of Hecules over the next two nights, and should be easy to pick up. one designation per line, into the the input box. You can get the data formatted for your favorite planetarium software. No, fragments of 73P will NOT hit the earth. Image Credit NASA/ESA/STScI (click to enlarge). In the wake of the mssive disintergration of some of 73P's fragments, a few people have been asking if some of the smaller chunks may hit Earth. The answer is a resounding no!. The reason can be seen in the Hubble image in this post and the spectacular video page, where you can seen an animation of 73P-B breaking up over 3 days. Go now, my favorite is the medium quality MPEG). As you can see, while 73P-B produces a spectacular number of small fragments, mots of them remain cloase to the parent body. Several of them seem to evaporate completely over this 3 day time fame (eg the fragment bottom right). The fragments that do survive are gravitationally bound, they will follow 73P's orbit around the Sun and won't hit us. 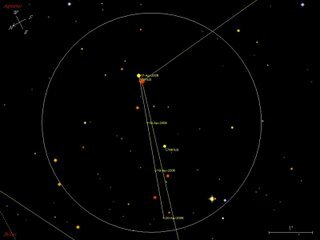 Have a look at the Celestia image below to see the relative postions of the comet and Earth. As you can see in the Celestia image (using the latest ephemeris), even at closest approach the fragments are quite some distance from Earth. 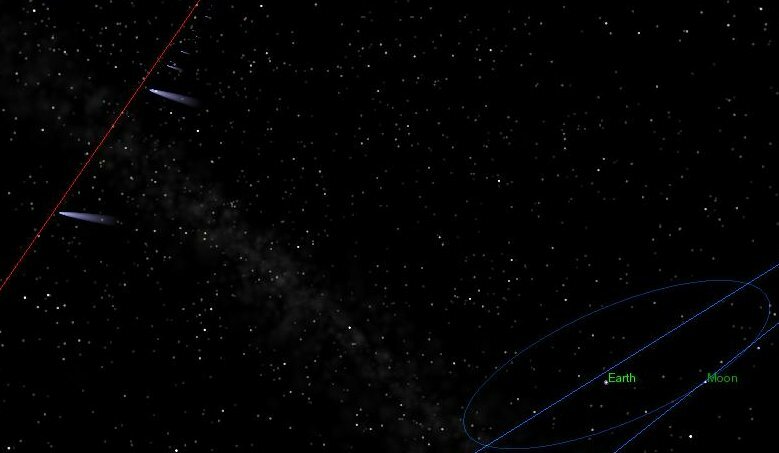 At closest approach for spectacularly fragmenting 73P-B, the comet is 0.067 AU, about 26 times the distance from the Earth to the Moon. Now some of those fragments are travelling sideways, but to have any chance of hitting earth, they have to be traveling at around 8 kilometers per second in our direction, and you can see from the images they are drifing much more lazily than that. Celestia simulation of 73P at time of fragment C's closest approach to Earth (click to enlarge). 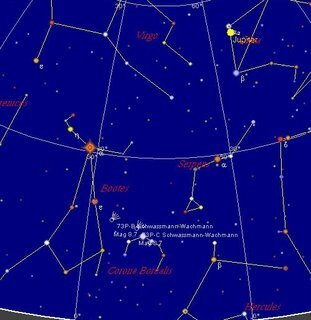 Will we get a meteor shower from 73P? Over on the comets list Carl Hergenrother points out that 73P is the parent body of the Tau Herculid meteor shower, which only occasionally produces meteors. Recent studies suggests that there will be no enhancement of the Tau Herculids this year (if they can be seen at all). There will be significant Tau Herculid activity in 2022, but this will be due to particles released in 1892. We will probably not enocounter the debris fro either the 1995 or 2006 breakups for quite a long time. This stunning image of 73P (centred on 73P-C, click to enlarge), was created using Celestia, with a comet definition file produced by Bernard Guillaud-saumur. 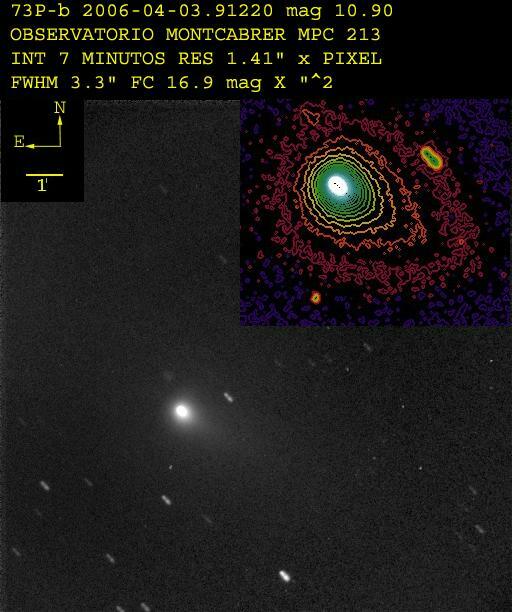 You can download his comet.ssc file here, and he updates it regularly (this is a marvelous resource for comets, he deserves applause for all the hard work). He also has a dedicated 73P page, which you might like to visit. It's pretty stunning with maps (lots of maps), ephemerides, Celestia views and animations. Dramatic images of 73P-G breakup! 73P-G has broken up dramatically, go to Carl Hergenrother's site and scroll to the bottom for amazing images. Hubble also has some great images, and details here. Fragment B is rapdily evolving and has had a large outburst (see this nice image) and here is a good animation of 73P-B. Fragment R is in outburst. Fragment C is still magnitude 7.9 and is doing fine. Sunspot group 875 has fired off a strong, M7.5 solar flare. Unfortunately the SOHO Lasco C2 and C3 cameras have no images from this time, so I have no idea if a CME was fired off or not. We'll have to wait a day or so to see if this flare is likely to produce aurora. Also drop into Sungazer for a video of yesterdays flare. While you are at it, remember that there are currently no plans to replace the ACE spacecraft? Why not write in to ask for a new solar wind monitor. My latest biology -inspired post is over at The Pandas Thumb. Two new sun spot groups (875, 876) have rotated onto the face of the Sun. Early this morning there was a C class and M class solar flare from these spots. The flares did not appear to produce Earth-directed Coronal Mass Ejections, so they are unlikley to generate aurora, but these spots should be watched as futher flares may be very likely to produce aurora. Stuart has also noticed this, and reports on the astounding proposal to stop funding aurora alert service. At Spaceweather, they report that there is no plans to replace the ACE space craft, our early warning space weather satellite. Given that NASA is about to increase manned missions, the lack of an early warning craft is foolish in the extreme. Comet 73P is still providing surprises. Yesterday Fragment 73P-B was reported to be in outburst again, with the Sun-forward sub-fragment being substantially brighter. The ESA's Very Large Telescope has also taken detailed images of 73P-B, showing more details of the fragments of the fragment (remember that Fragment B recently broke up). Recent amateur images of 73-P are here and here. The eastern morning sky at 5.20 am ACST. Similar views will be seen at equivalent local times elswhere (click for larger image). The next few days will be busy ones. On the morning of the 25th (Tuesday, ANZAC day) Venus and the Moon will be close together. For Adeladieans, on this morning the ISS will pass close to Mercury at 6:13 am ACST, at magnitude 2.3 the ISS will be hard to spot, but interesting none the less. Later that night, Callisto will be at maximum distance from Jupiter, and theoretically visible to the unaided eye (see here for spotting details). On the morning of the 26th (Wedensday) the Moon will be close to Mercury. On the morning of the 27th (Thursday) The ISS will pass between Venus and Mercury in most states. Adelaide 5:23 am, Brisbane 4:20 am, Melbourne 5:52, Sydney 5:52, and Hobart 5:56 am. More up to date predictions (the path of the ISS can change substantially over time), and specific predictions for your location can be found in my flares section on Southern Skywatch. The northeastern horizon at 11.00 pm ACST, similar views will be seen elsewhere in the Southern Hemisphere at the same local time (click to enrage to a more useful image). Fragment 73P-B has split into two fragments, as seen in these lovely images here, here and here. This image give probaly the first good view of the split nuclei, with intensity traces. Recent reports also suggest that fragment G may have split in two as well. Both fragments C and B are easily viewable in binoculars (if the clouds ever clear) and small telescopes. Fragment C (the lower one in the image above) is now magnitude 7.9 (ignore the magnitudes in the image, the comets have been evolving to rapidly for the MPC data) Fragment B is something like 8.5-8.9. G is around magnitude 15. Fragments B and C, being close to the stars of Corona borealis, are very easy to find at the moment (providing you aren't clouded out). Looking north-east, locate bright orange Arcturus (the organge star in the image above) then look down and to the right to a curved spray of stars, Corona borelais, the comets will be embeded in this diadem. one designation per line, into the the input box. The sun lights up Lunar Mountains on the terminator, and Venus in its half-moon phase. Hughie has been playing with me. We will have beautiful clear afternoons with the sky the purest blue, then shortly after sunset, the clouds will come over and persist unil mid morning. Lulled by this seemingly immutable pattern, I didn't get up early this morning to see if I could pick up any Lyrid lunar impacts. So when I did wander out in the early morn, the sky was celar and sparkly. I had to rush out and set my telescope up in a hurry, but I was able to get some nice pictures of the Moon and Venus in very stable air, unlike the last two times when the images jumped all over the place (and its been about a wekk since I was bale to do any imaging at all). Unfortunately, this was well into twilight and not too far from dawn, so no Lyrid impacts were going to be seen, and good contrast Lunar images hard to obtain. But you can still see the lava rilles quite clearly despite this. Can you see a the flash of a meteor hitting the Moon? Ordinarily such an event would be hard to see, because large enough impacts occur so rarely that the probability we are looking in the right spot in the breif instant of the flash is increddibly low. 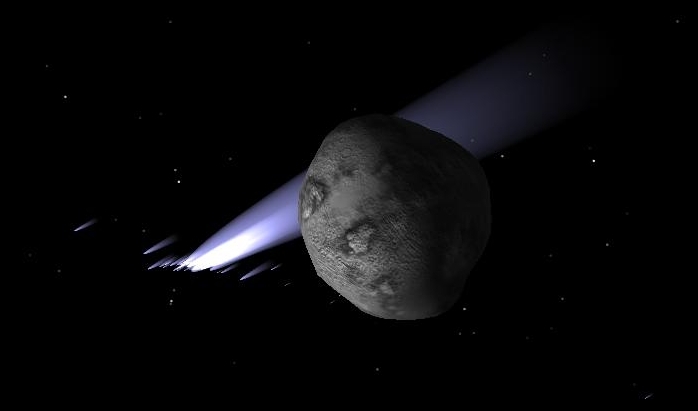 Our chances are much improved if the Moon is in the path of a meteor shower (and substantially dark). During the 1999 and 2001 Leonid showers, David Dunham recorded images of impact flashes. This year you have a cahnce to see Lunar meteor impacts yourself. On the morning of April 22 the Lyrid meteor shower crossed the Moon. While the lyrid shower is pretty dismal from the Southern Hemisphere, the Moon will be in an excellent position for us to see meteor impacts. 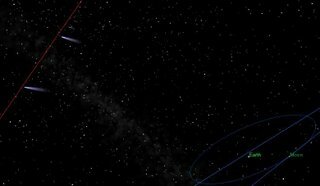 See this Space Weather article giving full details of the event. Also see this NASA article as well. Fragment B has definitely broken up, see these rather nice images here, here and especially here showing the development of fragmentary material in the tail. This page gives a nice overview of the various cometary fragments. 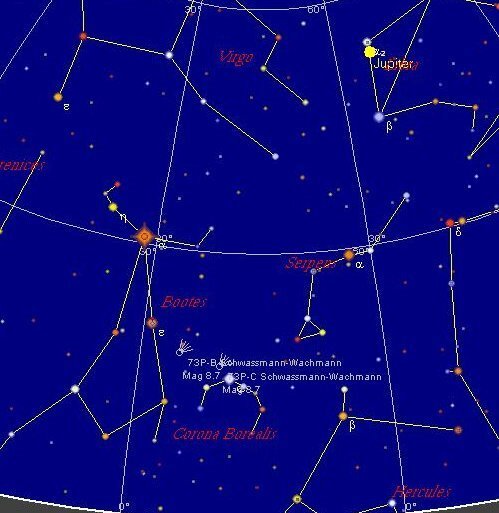 Various people have reported seeing fragments B and C in 10x50 binoculars, and as over the next few days fragment C is near alpha Coronus Borealis, this is a good time to go looking. Click to enlarge. Looking north-east as seen form Adelaide at 11:00 pm ACST (most of Australia will have similar views at the smae local time). 73P has been causing excitement the world over form it's fragments hi-jinks. 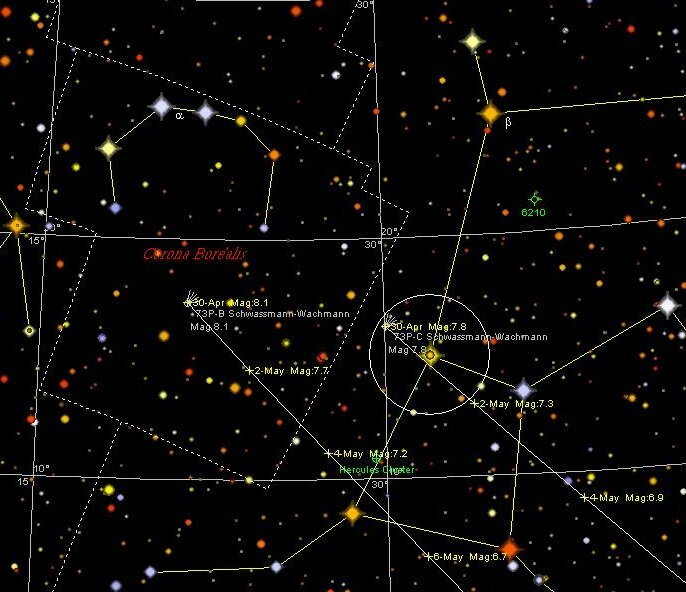 The two brightest fragents, C and B, are now potentialy visible in 10x50 binoculars (forget the magnitudes listed on the map, they are actually around mag 8.2), cloud permitting. Tonight might be a little toch and go, with the waning Moon rising when the comets are high enough to see, but the next few nights should be better. 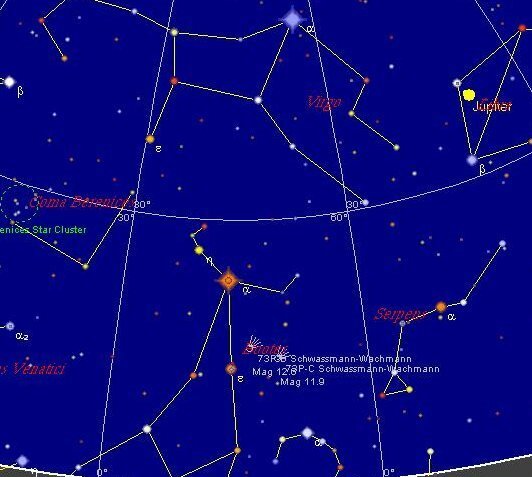 The comets are faily close to some bright stars, so should be easy to locate, start at bright orange Arcturus (the bright orange star in the map) and starhop down. Images of Venus and Mercury (the egg shaped blob) taken under adverse conditions. 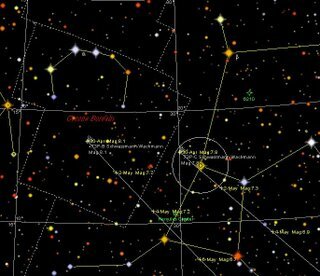 Venus and Uranus spotter map for 17-20 April, circle is the field of view of 10x50 binoculars. Click to enlarge image enough to be useful. Although Uranus is bright enough to be (just) visible to the naked eye, Finding it can be quite difficult. Over the next few days we have a very bright signpost, Venus. 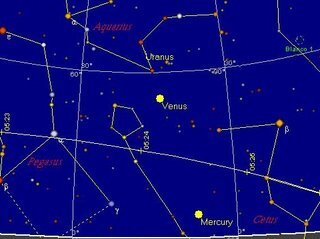 Between Monday 17 April to Thursday 20 April Venus will be within binocular distance of Uranus. The Spotter map above (click it to get a full scale view) shows that most nights Venus is just above Uranus (the circle is the field of view of 10x50 binoculars). Uranus is the second brigthest object close to Venus (all except Lambda Aquarii and a star near the bottom are less than magnitude 6, while Uranus is magnitude 5.9). 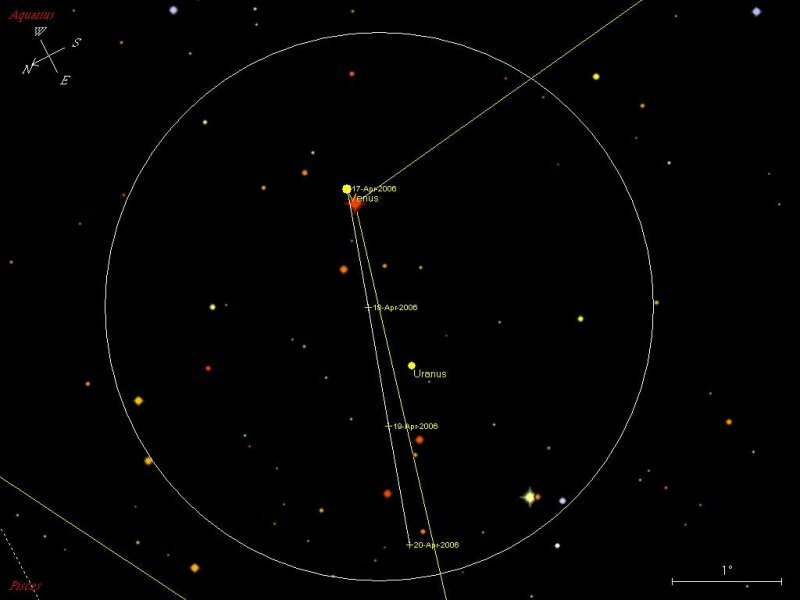 On the 17th Venus is also just 9' from Lambda Aquarii (the red star in the field just below Venus in the image above). See if you can see them separate with the unaided eye. 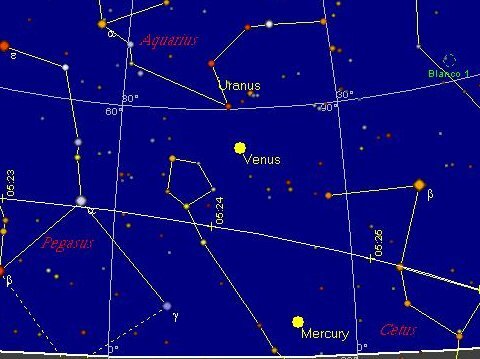 On the 18th and the 19th Venus and Uranus will be within wide field telescopic eyepices. Venus will look like a half Moon, and Uranus should be (just) a visible disk. Venus (bright dot near centre top) and Mercury (dimmer dot just above roof line), glow in the predawn eastern sky. Easter is what is termed a "movable feast". A celebration that is not fixed to a given day. This is because Easter is defined as the first Sunday after the first full Moon after the Vernal (Spring) equinox (the Paschal Full Moon). The Paschal Full Moon is an ecclesiastical full Moon (based on tables drawn up by helpful astronomers), and can differ from the Astronomical full Moon by a day or so. The Western and Eastern (Orthodox) Christian churches use Georgian and Julian calendars respectively, so their dates for Easter can be one or two weeks different from each other. Once, on a radio interview, I was asked how to calculate the date of Easter. Embarrassingly, I had no idea at the time (other than it was the first Sunday after a particular full Moon). If you want to calculate the date of Easter yourself, here is a good page from the Astronomical Society of South Australia on calculating Easter (you can do it with a pocket calculator). This BBC site gives you computer code to do it, and finally this site calculates it for you (and all the sites give fascinating historical details of calculating Easter). Last night had a full Moon in a cloudy sky, and Chez Reynella was off at a friends place enjoying spagetti Marinara. So of course a mid latitude aurora warning comes through (which I don't find until this morning). Sheesh, this is supposed to be Solar Minimum. As I've mentioned before, I'm one of the chapter authors in "Why Intelligent Design Fails". I wrote Chapter 6, "Evolution of the Bacterial Flagellum". 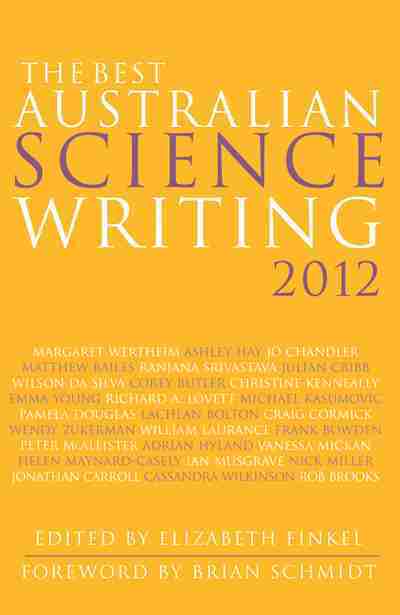 Despite being an academic book, it has had two hard cover printings, and a paperback printing was published this year. Well, it's sold out, and they are doing another print run. This is almost unheard of in academia ("Prejunctional modulation of the Autonomic Nervous System" didn't go beyond one hardback edition). True, the second print run is only a 1000 copies, so Dan Brown isn't in danger, but I am rather chuffed that our little contribution is doing so well. You can get it from Amazon.com , but why the cover of "Marketing Marrianne" is displayed is unknown. And do drop by The Pandas Thumb for my latest essay. Fragment B of comet 73P has been behaving oddly during its outburst. Is it disintergrating? There has been a lot of discussion about this on the comets mailing list. Here are some images for you to look at that show the comets unusula features. 73B over several days, a very nice gallery of 73P fragments (including B), a good recent image, another good one, and finally an animation of some minor fragments. 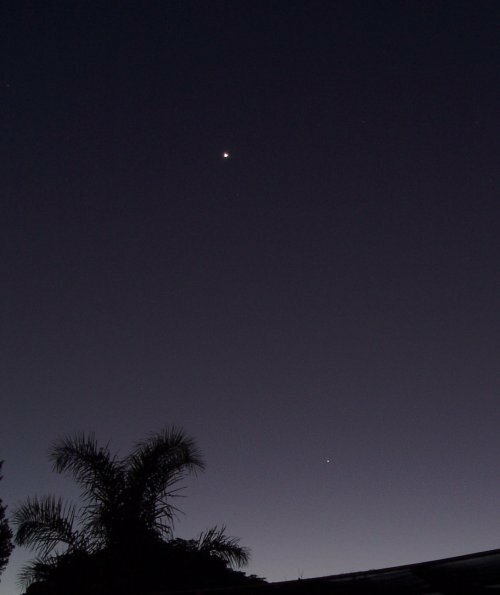 Got up this morning to a beautifly clear sky, with Venus shining brighly, and Mercury glowing below it. 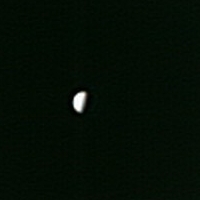 Got out the scope, set it up, a wisp of cloud was hovering aorund Mercury, but the sky was otherwise clear. Turned to the computer to set up the imaging program, turned back, and the sky was wall to wall cloud. sigh. Moon and Spica as seen from Darwin at midnight (click image to enlarge). 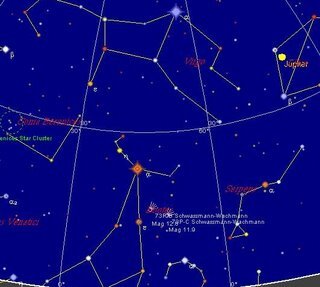 The Moon will occult the bright star Spica (alpha Virginis, magnitude 1) on the early morning of April 14 (April 13 in India). This will be visible from Northern Australia (NT, Northern WA and North QLD), Papua New Guinea, Indonesia, South East Asia and India. Representative local times are given in the at the Southern Skywatch Occultation section (sorry, tables don't seem to work properly in Blogger). The IOTA Spica Occultation page gives a lot more cites, but in Universal time, so you have to do the conversions yourself. The full moon will make viewing the dissapearance and reapearance of Spica hard to see with the unaided eye. This occultation is best viewed with binoculars or a small telescope. 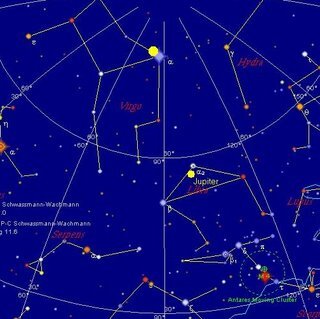 In locations outside the occulation track, Spica and the Moon will appear evry close togeher, and will be interesting to look at. anniversary of the beginning of manned space flight. On April 12 1961, 45 years ago, Yuri Gagarin was launched into space, the first human to travel beyond our fragile world. This is also the 25th anniversary of STS-1, the first Space Shuttle flight, with John Young and Robert Crippen. What will you do for Yuri's Nlight? I'm going to have a loook for the ISS, and tell my kids about Yuri Gagarin and his flight. If you are more adventurous, you can go to a Yuri's Night Party. There is one in Adelaide (see the party link for contact details), and one in Sydney at the PowerHouse Museum (see party link for contact details, not on the PowerHouse site). If you can't go, why not have a mini-party at your place? Matt reminds us that Apollo 13 was launched on this day. Venus Express has made it! See the ESA Venus express site for a short news item and the press release video. See also the Bad Astronomer, Tom and especially the Planetary Society Blog for commentary. Aslo see the ABC science story on this. Venus Express goes into orbital insertion 17 hours after this post (that's around 5.00 pm AEST). All systems appear to be go. Fragment B continues in outburst, and despite some fears that it might disintergrate completely, it appears to be hanging on in there. Fragement B is still brighter than C (just) and at magnitudes 9.0 and 9.1 repectively, they are brighter than ephemeris predictions. Currently overwhelmed by the Moons light, by the time the Moon wanes they should be easily visible in 10x50 binoculars. 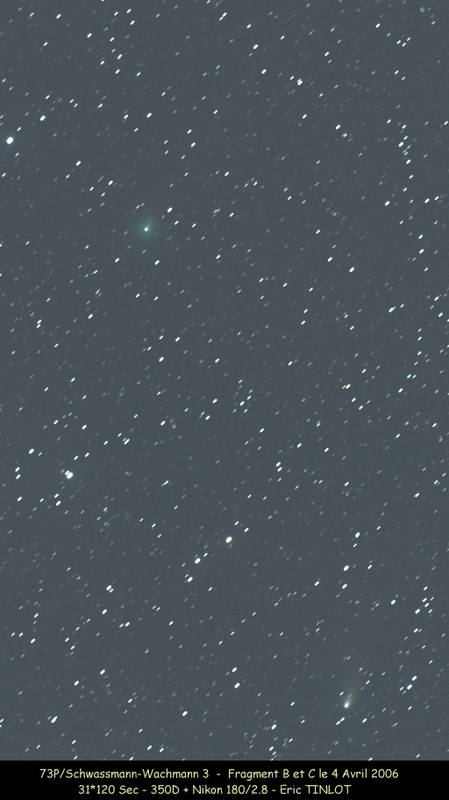 More fragments keep being found, as well, this is one exciting comet! A nice shot showing C, B and G fragments all together is here. Some nice individual shots of fragments B, C, G and R is here. As well, here is an image of fragment M.
We are having another (mostly unexpected) aurora. 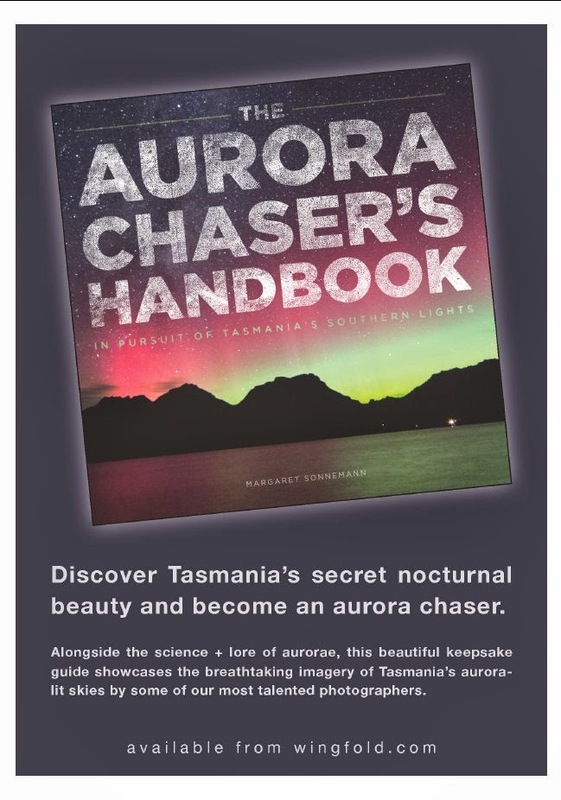 aurora have been reported in Tasmania a few moments ago, and the solar wind magnetic field went southwards sharply just now. If you are in New Zealand, Tasmania or Southern Victoria, go outside and look southwards NOW (allow some moments for your eyes to adjust to the dark). Pale green glows, with some sheets and rays should be seen in Tasmania. Click to enlarge (and it enlarges quite a bit). Finally the clouds parted and I was able to get some shots. ALthough not for long. I manged to get this sequence and make a partial mosaic in the Gimp (the Guide to Gimp for Astrophotography is still coming) before the clouds rolled in as I was imaging. The quality isn't good because of this (messing up the exposures as well). 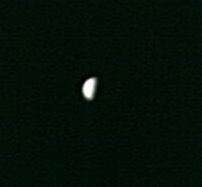 My Venus phase campaign has suffered a bit of a set back, no images for 14 days due to cloud and rain, but I got one this morning. 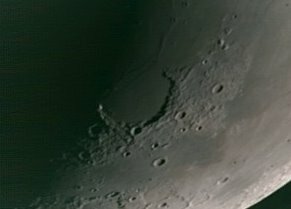 Tonight was clear, cold and cloud free, and I was hoping to make a full mosaic, but even after equilibrating my telescope for over an hour, the seeing was terrible. Oh well, better luck next lunation. Blue rings are generally associated with poisonous octopi, but Uranus's faint outer ring, discovered last year, turns out to be blue. Saturn also has a blue ring (the only other planet with a blue ring), associated with the small moon Enceladus, while Uranus's blue moon is associate with the orbit of the small moon Mab. The blue colour is probably due to the small size of the particles scattering light. 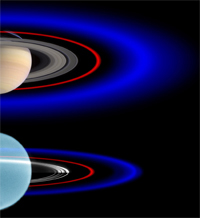 The blue ring around Saturn is probably due to Enceladus's water gysers. How Mab genereates its ring is unknown at present. ONe of the joys of familylife is the taxi service aspect. I had the camera set up to record the Iridium flare, but After ferrying people to sleepovers and and meetings, I got back home just as the iridium satellite was fading near the Moon. Also, I had forgotten about the Moon with Callisto. The Moons light made it difficult to see Callisto in binoculars, let alone with the unaided eye (sigh). On the 17th the nearly Full Moon will be not far from Jupiter, but there is a short time window at 8:00 pm where Callisto may be visible. The 25th looks like our best bet this month. According to the Adelaide Advertiser, South Australian born astronaut Andy Thomas wants to make Woomera into a space port, for launching both satellites and tourists. That takes me back. When I was young, Woomera was one of the few rocket launch sites in the world. For a brief while, Australia was a space-race nation, launching the Black Arrow, Skylark and the Blue Streak missiles (oddly, the Woomera Pad site doesn't list the Bue Streak, even though they were launched there). I had dreams of working in space, and in a (now embarrassing) rush of youthful enthusiasm, a mate and I wrote to Woomera asking for funds to develop Cavorite for spacetravel (well, what did we know, HG Wells sounded authoritative). They never replied, but my dream of space flight persisted. Time passed, Britain and Australia lost interest in rockets, and the Woomera facility was largely moth balled. We did have a very successful sub-orbital upper atmosphere rocketry program and and X-ray astronomy program, but that finally finished, and now the Woomera launch site is mostly silent (except for the occasional ScramJet flight). And it wasn't there. The Museum had moved last year, and they hadn't unpacked most of the Woomera stuff yet. There were a couple of unlabeled launching bodies, and what appeared to be a satellite motor, but that was it. The staff were helpful as they could be, but weren't space enthusiasts, they had no idea when the display would be restored, or what the launching bodies were, or where the thruster came from. Don't get me wrong, the aviation museum is fascinating, but I had specifically taken Stuart out in heatstroke conditions to see the rockets that his dish at Jodrell used to monitor, so not having them there was disappointing. Later we peered through the chain-link fence at the back of the museum at a Blue Streak hulk, partly buried under bits of a flying doctors plane. It was a bit sad. Now Andy Thomas wants the Government to spend $150 million to set up a commercial launch and space tourism center. Shooting the wealthy into the edge of space in a glorified glider wasn't what I imagined when I wrote to Woomera all those years ago, I had in mind a more gleaming Gernsbackian spaceprot where I would fly to Mars to study lichens, or explore the steaming Jungles of Venus, but it would be great to see it used again, and Australia join the space capable nations. This image shows the path of the ISS satellite on Saturday April 8 as seen from Adelaide (facing north-north-east). In Hobart the satellite passes closer to the Moon, in Melbourne, Perth and Brisbane closer to alpha Leo, but otherwise the views are much the same. (click to enlarge). 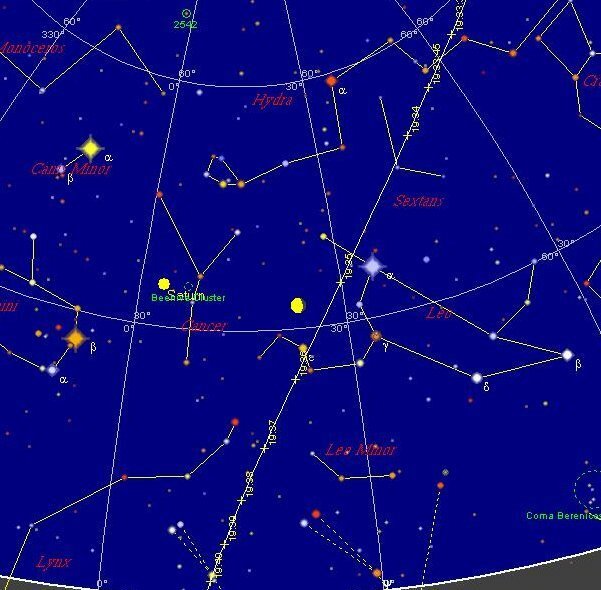 While waiting to see Callisto, people in Adelaide, Hobart, Melbourne, Brisbane and Perth (Sydney misses out for some reason) will see a nice bright Iridium Flare (magnitudes -7, -6, -2, 0 and -8 respectively, for comparison, Venus is magnitude -4.6 at the moment and Jupiter -2.4). The satellite track is shown in the picture. The Flare maximum brightness is at 19:34 in Adelaide, 19:25 in Hobart, 19:36 in Melbourne and Perth and 19:12 in Brisbane. 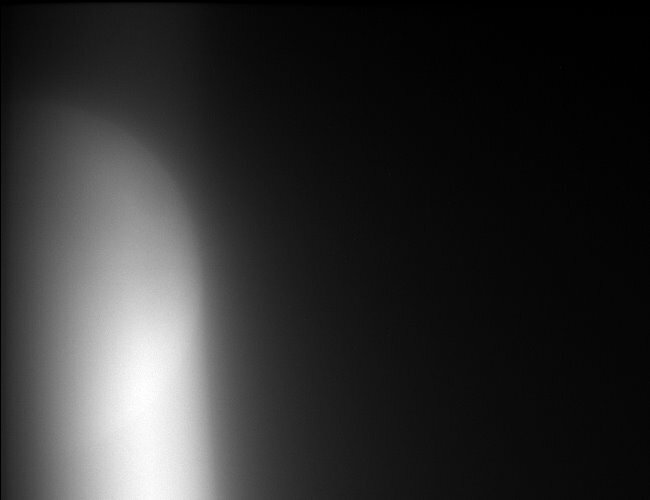 In all cases the flare should appear in roughly the middle of Sextans, just above Leo. If you want to check your own location, see my flare section at Southern Skywatch. Orientation of jupiter and its Moons at 10:00 pm (local time anywhere in Australia). It was a discussion with a Velikovsky supporter that alerted me to the fact that the Jovian Moons are potentially visible to the naked eye. As you may know, Velikosky claimed that Venus was originally a "comet" ejected from Jupiter. He also claimed that the myth of Minerva springing from Jupiter/Zeus's forehead was based on visual observation of Venus "erupting" from Jupiter, accompanied by bright lighting bolts from Venus to Jupiter. Unfortunately, they would have never seen it. All of Jupiter's Moons are bright enough to see with the unaided eye (Ganymeade, the brightest is mag 4.6). Although Callisto at Magnitude 5.7 is just above the limit, and you would need dark skies to see it. Yet you can see none of them (unless you follow the instructions below). Part of this is distance, and the other part is brightness. The human eye can generally distinguish objects 4' (arc seconds) apart (people with excellent vision can see objects 1-2' apart), although more practically this limit is more like 8-25' depending on age and how good your eyesight is. Io and Europa never get much more than 2' and 3' away from Jupiter respectively, so most people would never be able to see them. 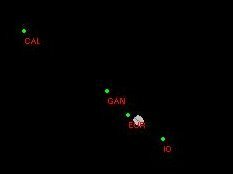 Ganymeade and Callisto get to about 5' and 10' respectively at Jupiter's closest approach, and could theoretically be seen, but the brightness of Jupiter overwhelms their light. Venus would be quite a bit brighter than the Jovian Moons at Jupiter's distance, but still substantially less than Jupiter. A Venus sized object at the distance of Jupiter could possibly be seen at the 8' limit. This would be long after any eruption and "lightning bolts" had happened. So rather than seeing Venus dramatically erupt from Jupiter, exchanging lightning bolts with it, a keen-eyed shepherd might have seen a moderately bright star creep slowly away from Jupiter over several hours/days, provided that Jupiter was at closest approach and Venus was ejected at right-angles to the shepherd's line of sight (otherwise they may not have noticed it for days). Casual observers would never have noticed. Hardly the stuff of legend. But there is a way to see Callisto without either telescope or binoculars. Like seeing Venus in Daylight, you need to block out the light of Jupiter. This works best when Callisto is at its furthest from Jupiter (and when Jupiter is reasonably close to Earth, so the apparent separation is largest). You will also need dark skies of course, so if you are not in the country, you might like to plan a nighttime trip to the country. 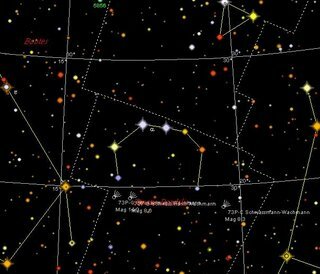 The night of April 8 is the first good opportunity we have to see Callisto (there are about 6 others in the next two months, 17 and 25 April and 3 May and 11 May are probably the best). You will need to be able to see Jupiter (here is the location map for Jupiter), and to have a large object like a wall or roof to block out Jupiter’s light. Because Jupiter is rising straight up, Jupiter's Moons are above it, so you need something that blocks Jupiter from below (like a roof line) rather from the side (until around 1.00 am, when Jupiter levels out). The image above shows how Jupiter will look in binoculars at 10:00 am. With Callisto above and to the left a bit of Jupiter, slowly move so that Jupiter is just covered by the obscuring object, and Callisto should be just visible as a faint star just above the obscuring object. You may need to check the appearance of Jupiter and it's Moons in binoculars, to be sure of what you are seeing. It will be a challenge, but it should be an interesting challenge. Image Credit SOHO/NASA. Despite no coronal mass ejections recently (takes a while to load), we had an auroral display in Tasmania last night. Apparently the earth has intersected a solar current sheet, setting off a minor display visible at high lattitudes. People reported pale green glows, pulsing green curtains, and some rays. Check out the blog of The Angry Astronomer. He has some nice eclipse images. 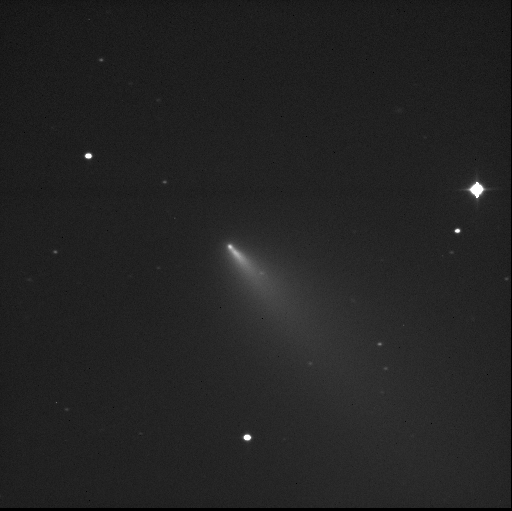 Comet(s) 73P/Schwassmann-Wachmann may not be as bright as hoped (possibly getting up to magnitude 4.2 for the brighter fragment, but it is certainly a very dynamic group of comets which have observers fascinated. Fragment B is still in outburst mode, and is now about as bright as Fragment C (the supposedly brightest fragment). But at magnitude 9.5 this is out of the reach of binocular views yet. A nice fragment B animation is here. More and more fragments are being described, there are 19 offical fragments, and probably more to come. No more news of the staus of the apparent G split. For amateurs with binoculars or modest instruments, fragments B, C and G are the ones to watch, and we may see some interesting sights in the coming weeks. Recent photometery of Comet 73P/Schwassmann-Wachmann suggests the brightest component, Fragment C, will now only reach magnitude 4.5 or so. This is not as bright as earlier predictions of magnitude 3 to 2.5, but still respectable and easily seen from most sites where light pollution isn't too bad. The comet is still exciting though, Fragment B is apparently in outburst, and Fragement G appears to be splitting up. Go here for some nice images, including the G split, and here for the Fragment B outburst. Other very nice comet images are here. And not a drop to drink! Stuart and Megan might appreciate this. Radio astronomers at Jodrell Bank have detected large clouds of alcohol in space. Unfortunately, it's methanol. Image Credit SOHO/NASA. Despite being at Solar Minimum, the Sun is currently sporting a trio of sunsots, which might be visible using safe solar projection techniques. 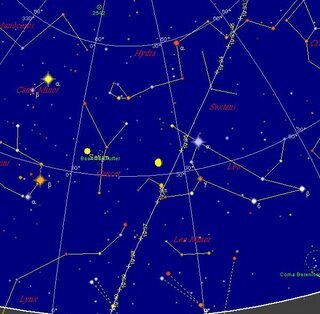 April's Southern Skywatch is finally up, delayed by kids birthday parties, sick kids and computer problems. An unaided eye comet, unaided eye Callisto, an occultation of Spica and good Mercury viewing are contained therein. 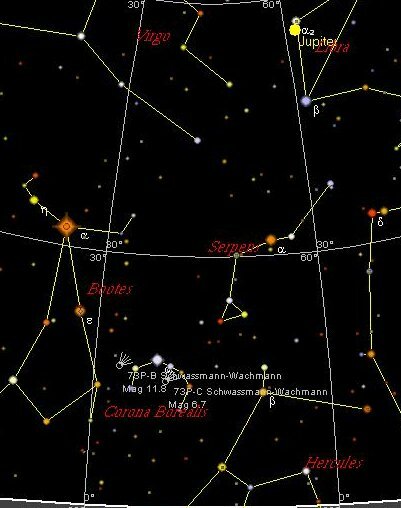 Comet 73P/Schwassmann-Wachmann is potentially the best comet for a while, and it will be visible to the unaided eye in late April, being brightest in early May (probably between magnitudes 2 and 3, basically a fuzzy dot). However, Comet 73P/Schwassmann-Wachmann is actually a series of comets, as the original comet broke up around 1995/1996. The unaided eye comet I referred to is actually Fragment C, Fragment B will be visible in binoculars, and there is a range of fragments which will be visible in small telescopes. All in all this procession will be interesting to watch. For some lovely first images of these comets, see here and here. 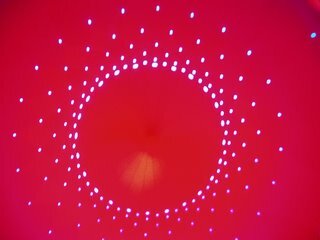 This is not some imgae of an alien sky, but the roof of a remarkable installation we saw at the Festival at the Commonwealth Games. 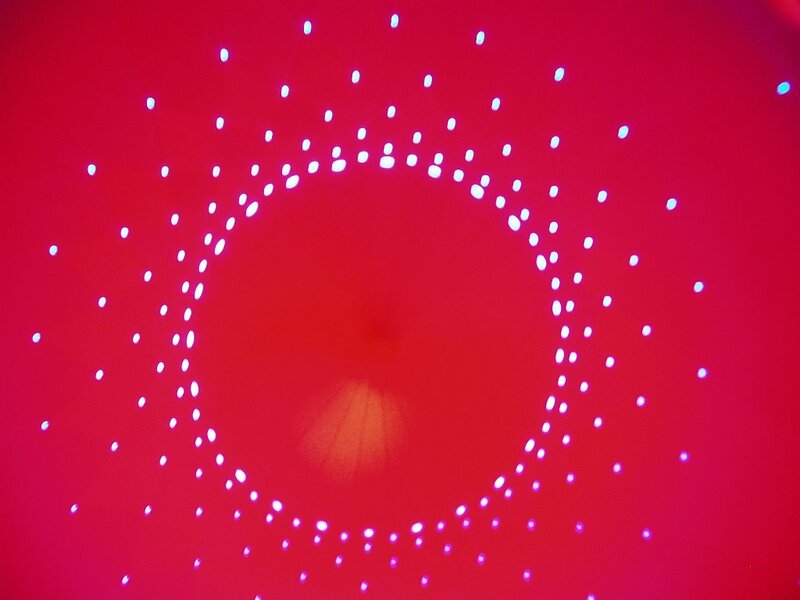 The Luminarium, Levity II, is a giantic tent like structure, with coloured panels making a fantastic world inside. I'll post some other shots of this at a later stage. 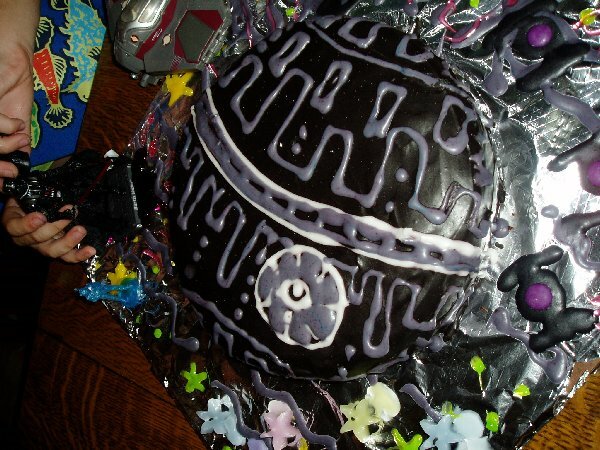 Middleone turned 7 yesterday, and we had a Starwars themed sleep over. 7 boys dressed in Starwars costumes running around with light sabers was quite a sight (actally, one was a Power Ranger, but that's okay). The Death Star birthday cake was a hit too (we are such Geeks at Chez Reynella). So not much sleep last night, and another Birthday to go to tonight, but I've got some more astro information and stories coming soon.